Sensation. While AMD's Ryzen architecture has already been available in the desktop range for several months, the notebook range had to wait patiently for a long time. The waiting is over now: Asus is the first manufacturer who provided us with a gaming laptop with 8-core CPU and Radeon RX 580. Our review will reveal whether the bundle is able to challenge a combination of Intel and Nvidia hardware. На данный момент ROG Strix GL702ZC — это игровой ноутбук с самым производительным центральным процессором. Даже модификация с Ryzen 5 1600 в таких задачах, как обработка графики, кодирование видео, криптография и архивирование данных, легко обходит флагманские мобильные чипы Intel Kaby Lake. Да, в природе существуют модели ноутбуков с настольным Core i7-7700K, но очевидно, что версия лэптопа с Ryzen 7 1700 окажется заметно быстрее в ресурсоемких многопоточных задачах. The Asus ROG Strix GL702ZC is fast, especially in multi-tasking, but poor components and unbalanced design hinder it in other departments. Our Asus ROG Strix GL702ZC laptop review demonstrates that the AMD Ryzen 7 1700 delivers fantastic multi-threaded performance that will help tackle all sorts of tough tasks – but the presence of desktop components is a double-edged sword. It contributes to poor battery life and disappointing thermal results. The desktop chip falls behind mobile rivals in single-threaded applications. The Asus ROG Strix GL702ZC’s desktop processor may deliver great multi-threaded performance, but this power- hungry CPU, as well as the desktop Radeon RX 580 GPU, also contribute excessive heat and noise. An ideal laptop for those who want to work on the same platform as they play; but does a gaming machine need a CPU this powerful? Such has been the dominance of Intel over a couple of generations now that the majority of gaming laptops that come through the OC3D offices run a combination of an Intel laptop-spec quad core and then an nVidia GPU that fits whichever price point the laptop arrives at. The Strix GL702ZC indeed presents a high value proposition if you’re after the most overall performance for your money. Its AMD Ryzen 7 1700 eight-core chip makes it a beast of a machine for grunt work like encoding and rendering. It did just fine in our gaming benchmarks, too; the Radeon RX 580 inside this unit was on par with the Nvidia GeForce GTX 1060 in competing laptops. All this laptop had to do is compete with similarly priced Intel offerings, and it certainly did. It beats Intel in the multi-tasking and rendering, and it’s almost as fast when it comes to gaming. Throw in a few bonus features like an LED lit keyboard, punch speakers, impressive cooling, robust connectivity, and FreeSync, and you’ve got a great value for money bundle. It’s not as light and mobile as some may desire, but few 17.3-inch display laptops are, if any! ASUS ROG Strix GL702ZC (AMD Ryzen 7 1700, Radeon RX 580) review – a really good workstation with ROG’s branding on top? If you came to read this review looking for a confirmation of why you should buy the GL702ZC for gaming, you are going to be disappointed. From all the data that we’ve gathered, it seems like the ASUS ROG Strix GL702ZC is more of a workstation than a gaming laptop for two main reasons. 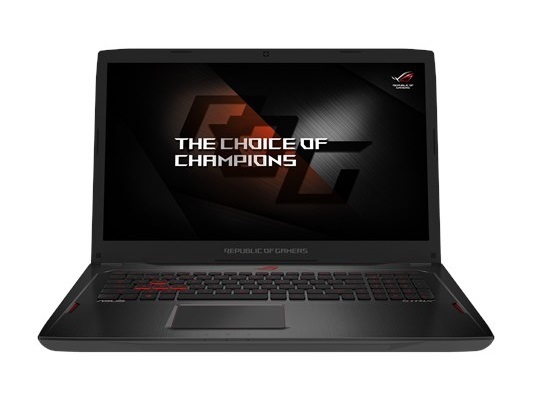 The ROG Strix GL702ZC is a pretty well-built laptop. The speakers are excellent, and the display doesn’t annoy you with poor viewing angles or washed out colors. The keyboard also feels good to type on, so the overall user experience is quite positive. The Asus ROG Strix GL702ZC has a desktop-level CPU and plays most games well, but it gets hot fast and has slow storage speeds. ROG Strix GL702ZC is far from perfect, yet it echoes AMD Ryzen's penchant for disruption. Where else can you get an eight-core, 16-thread laptop for under £1,500? Again, ASUS has deveoped a purpose-built notebook that completely closes the gap between desktop and laptop. Normally when we say desktop replacement, we normally refer to the gaming performance of a system but in this case its a complete top-down solution bringing true desktop class performance on the go thanks to its 8-core Ryzen CPU. While it may identify as a gaming product, the ASUS ROG Strix GL702ZC 8-core gaming laptop is a professional workstation thoroughbred capable of delivering so much more. AMD Radeon RX 580 (Laptop): Флагманская видеокарта AMD на базе архитектуры Polaris, произведенная по улучшенному 14 нм техпроцессу. По производительности близка к настольной Radeon RX 580 Эти карты обеспечивают наивысший возможный для мобильных компьютеров уровень производительности в 3D. Они вполне способны справиться с современными играми при высоком разрешении и выкрученных на максимум настройках графики. Однако в силу того, что данные видеокарты потребляют очень много энергии, они используются только в больших ноутбуках со слабым временем автономной работы. 1700: Быстрый настольный восьмиядерный процессор архитектуры Zen с частотой до 3.75 ГГц. Обеспечивает 16 вычислительных потоков, представлен в начале 2017.